M&A activity for the third quarter of 2018 remained strong with small businesses selling for record highs. The third quarter boasts the highest median sale price on record, since BizBuySell begin tracking and reporting the data in 2007. The ask-to-sale price ratio was also up to 93%, demonstrating buyers and sellers are well aligned in there perspective on company value. Furthermore, the outlook for the fourth quarter remains very positive with current business listings displaying growth in median revenues and cashflow over the previous year. According to BizBuySell, fourth quarter business sales are on pace to capture another record high in terms of median sale price, assuming the current ask-to-sale price ratio remains consistent. Read the highlights below or view the full BizBuySell Third Quarter Insight Report here. Connecticut Outlook: Do National Numbers Reflect Our Local M&A Transaction Environment? Does CT Have a Well-Balanced Market for Sellers and Buyers? Total closed small business transactions for the third quarter remained consistently high, keeping 2018 on pace to hit a new record level for businesses sold this year. Click image to view full size. The sale-to-ask ratio rose from about 92% to 93% for this past quarter, speaking to the current market environment, equally beneficial to sellers and buyers. With strong revenues to back up sellers, both sellers and buyers are seeing eye to eye on the final sale price of businesses. 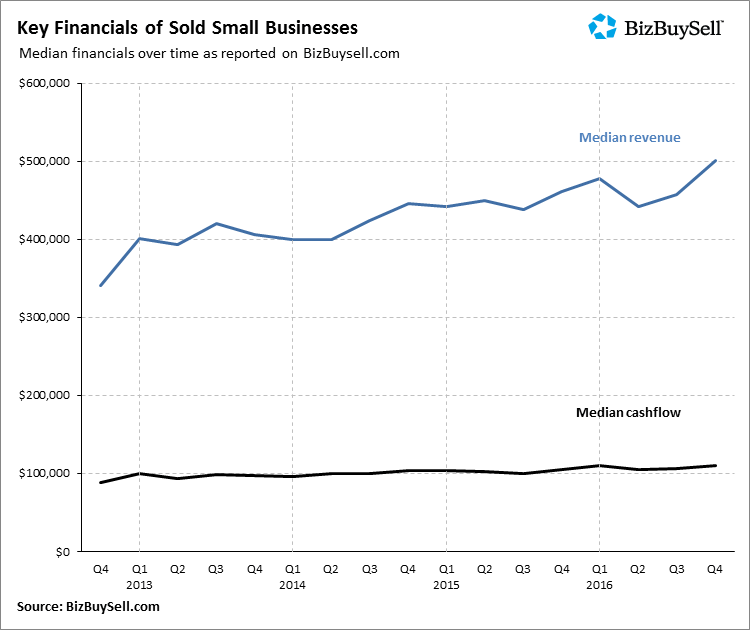 Median revenues have risen and overall sellers are demonstrating a strong financial position, lending itself to final valuation prices and willingness of buyers to pay higher prices in order to inherit financially strong companies. VR Business Sales New Haven represents owners of businesses valued between $500,000 and $25 million or with annual revenues from $1 million to $25 million. The office provides exceptional merger and acquisition advisory services to companies operating within a wide range of industry segments in Connecticut, Southern New England and Metro NY.